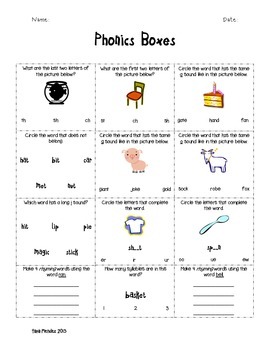 This worksheet lends it's hand to everything phonics: from syllibication, to missing sounds, vowel sounds, ryhming, & beginning and ending sounds. This worksheet can be used for stations/centers, srecursive review, homework for students who are struggling, quick morning work or a simple & quick guided reading activity. The pictures are a great aid for students who are struggling. I can create these weekly if necessary or as requested!!! !